Just managed a medium distance run after work tonight - eleven miles. Wasn't the quickest but it was at least steady. I felt yesterday's reps for the first half but after that I was running nice and easy. Pace wise I was around one hour thirty half marathon pace so it wasn't really that bad. Then I hit the gym for half an hour on high resistance bike before a quick session on the weights. After all that I was pretty knackered so I will take tomorrow off to prepare myself for the final long run on Saturday. I still have to decide on the route - something with a little interest is called for - not a straight out and back that's for damn sure. Thought for the day: Be nice to your kids. They'll choose your nursing home. Yeh verrily 'twas an excellent day on the track. I had a cracker tonight. Five - ney, make that six 1k reps. I was only going to do five - as per the last few weeks - but I stepped up. Not only that I also managed to knock 3s off the average repetition time of my previous quickest session taking the average from 3:26.5 (for five) down to 3:23.5 - now that can't be bad. The individual reps were a bit up and down but overall they were quicker. 3:31, 3:16 - don't know where the hell that one came from - 3:20, 3:24, 3:27 and finally 3:24. I was on fire - thought someone was going to call the fire brigade. Thought for the day: Never do card tricks for the group you play poker with. It was a much better day of training today. I managed to get down the gym for 45 minutes of high resistance bike - and I mean high resistance - I had to lift off the seat for two of the four hill reps in each set. Then I hit the weights for half an hour before heading home for a quick spot of undercoating the skirting - no rest for the wicked. Finally it was over to Cribbs Causeway for a recce of next Tuesday's Axa Inter-Companies 5 Mile race - which happens to be about 9k. Graham showed me the route - or what we hope will be the route - he hasn't run it for a few years so we might just have recced a very nice 9k training route instead - we'll find out next week! Thought for the day: Duct tape is like the force; it has a light side and a dark side, and it holds the universe together. Thought for the day: There's a pinch of the madman in every great man. I ran like King James II today - rather than Duke of Monmouth. For the non-historians among us that's the two opposing sides of the Battle of Sedgemoor, 6th July 1685. King James II won but it wasn't a 10k race in those days - and the loser had his head chopped off. Now that's not to say I won because I most certainly did not - I'm just glad they've changed the rules on the head chopping off front - still have mine - I think! I had a surprisingly bloody fine run considering yesterday's 15 mile tempo-ish run, followed by golf in the afternoon and then a meal at the local Chinese restaurant in the evening (and the dreaded booze) to celebrate my dad's 65th. I was feeling slightly 'delicate' this morning but fortunately Graham C was driving so I was OK on that count. We arrived with plenty of time to spare and managed to fit in all of a five minute warm up before the start. Graham, it has to be said, didn't have the greatest of runs this morning and as his school report would have said - there's room for improvement. I set off steady, aiming for - well, I didn't really have a target. After a slowish start over the first 2k uphill I settled into a easy rhythm and basically worked my way through the field. I really wasn't racing today but it was a damn fine tempo run. For the last 8k I was banging out very consistent kilometres at around 3:57 give or take a few seconds. I was a bit cheeky to the other runners - for which I apologise - because I was passing the time of day with all the spectators and marshals. While they were all racing their socks off I was just pootling along. Anyway, the only exception to the even k's was the last one, where I took the handbrake off, and knocked out a 3:40 to creep just inside 40 minutes in 36th place. I have to say that I didn't think I would be that quick so I am fair delighted. It wasn't that long ago that I couldn't get under 40. Now I can practically jog it. Today was a real confidence boost. I feel I'm back at the top of my game. I've a twinge of regret that I didn't take the race more seriously and miss the long run yesterday because I strongly believe a PB could have been on. In reality though, I know that the long run was more important. There will be loads more chances for the 10k but far fewer marathons. It was nice to see Brett S running again - after injury sustained during the castles relay. I overtook him in the last couple of kilometres (had to say that - sorry). Hopefully he can continue steadily improving back to form. Thought for the day: Consciousness: That annoying time between naps. Didn't make the distance. With hind sight, twenty miles along the cycle path was probably not a great idea. Nice and flat - yes. Variation to keep the brain from dying - NO. It was mind numbing. Pace wise it was good, weighing in at 6:55 verses 6:45 marathon pace but distance wise I was four and a half miles shy. It wasn't that I couldn't have gone on - because I feel I could have gone on at the same pace for miles - but I was just totally bored. In fact, I was so eager to get it over and done with that my last two miles were run at 6:30. I just wanted it over. I am going to run the Battle of Sedgemoor 10k tomorrow. I guess it's not going to be my quickest race ever but should be good to run it as a tempo after a today's reasonably hard effort. 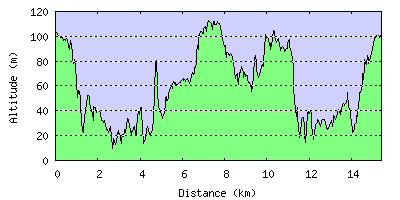 I guess I'll look to fit in a semi-long run on Monday - but I will choose a much more interesting route. Thought for the day: Artificial Intelligence usually beats real stupidity. Didn't train today as I'm going to try and run a pacey 20 tomorrow. I'm also playing golf in the Knowle Invitation at 12:30 so it's an early start for me - half past six on a Saturday - now that's just not right. Think I'm going to head out to Bitton again as it's a surface on which you can build a steady rhythm. Going to run the Bath loop then the Shortwood loop which, if my calculations are correct, should be bang 20 miles. I'm not going to say what time I'm aiming for - in case I don't make it - but hopefully it's going to be quickish and negatively split - ooh, sounds painful. Thought for the day: Why do bills travel through the mail at twice the speed of cheques. What an alliterative beauty that headline is! Really though, I felt a bit jaded today. Maybe it's the thought of the quick 20 miler I have to attempt on Saturday but I couldn't get myself out for a run today. I was up early (6:30) for a job over in Avonmouth before the day job kicked in and then over to set up somebody's website in the evening. Got home at 7:30 after a long day - managed to fit in an hour on the bike though so it wasn't all hard work - well, actually it was - I had the bike on high resistance! I feel a bit knackered now - looking forward to the bank holiday weekend - if only for the rest. I still feel the running is going well though - maybe not quick on the short stuff but I'm feeling good for the long. I'm a bit tired is all. Nothing a good night's - make that two night's - sleep won't cure. Thought for the day: I smile because I don't know what the hell is going on! Well that didn't go great. Perhaps not the worst but it sure feels that way. At least I managed the full five because I was close to jacking it in after the fourth kilometre rep was so slow. It was a combination of things tonight. Yesterday's tempo run didn't help I guess and the wind on the back straight was 'in yer face' tough. I was loosing 2-3s each time I ran it - it was so tough, in fact, that I switched start point so I only had to run it twice instead of three times. My reps were 3:29, 3:27, 3:30, 3:35 and 3:30. In all honesty the wind probably accounts for 63.1% of the discepancy from last week but at least I completed. The lads were out in force - it was practically a full house. The track was well congested - like the M25 on a Friday night. Even Tim W was running - and showing the lads how it's done I have to say. Having said that, the lads looked pretty sharp tonight - running their 300, 200, 100 session. I'm not going to mention that Harry P seemed to slow a little towards the end of the session because I promised I wouldn't - so I haven't, alright (nudge, nudge, wink, wink). And Nick, what the hell is that Tesco meat counter hat all about - get a grip man. Thought for the day: Atheism is a non-prophet organization. I decided the tempo was a better option than the hill reps tonight - but so the hill reps didn't feel unwanted and unloved I ran up over Dundry - nice. It was a good run. Very relaxing - well as relaxing as a full tilt tempo run can be but it really helped to clear the mind of all life's ills - in my case that doesn't take much and not that I've got any ills to speak of either but you get my drift. I felt a bit weak going up the main climb but once I was up top I soon got into my running. I picked the pace up throughout and by the end I was flying. The last mile was a 6:06. Thought for the day: I'd rather be over the hill than under it! Berlin is on. I had my race pack through the post on the weekend. I'm number 11624. It's really hit home that the focus of my entire running year will be over in a few short weeks. Feels kind of weird. Win, loose or draw it will soon be time to select a new challenge. Ich werde drei Stunden brechen - und Sie können das nehmen der Bank. Praise be for an easy run that was - well, easy. My legs actually felt better after yesterdays run than after last weeks long run but I'm still very glad we only did 40 minutes this time and with that Rick has managed to move himself from my foe list back to my friend list. Good luck to all those running at the Avon League meeting. I'd love to be there with you but I've got the little matter of a golf competition to win! Hope the 1500m goes well. Thought for the day: Death is hereditary. The 25 miles became 28. That's the longest distance I've ever run - yes, I've gone 28 miles before but on both those occasions I was doing a fair portion of walking. This time I ran the entire distance. I even forced myself to dig deep on the ascents of which the total was somewhere in the region of 3,000ft. The climb to the top of Lansdown was a toughie - almost brought me to my knees - but I made it. There's a nice plaque thingy-ma-bob at the trig point telling you all about the Battle of Lansdown Hill in 1643 - but I didn't have time to stop and read so I'll never know who won! My pace over the first eleven miles was a smidgen too fast - and much too fast at intermittent points. One kilometer was 6s inside 2:55 marathon pace - which was foolish to say the least. Graham enjoyed his run - I think! He was still alive at the end so I'll take that as a sign he enjoyed it - or at the very least did him some good. I have to admit I was pretty spent after the climb to the top of Lansdown and the run back was hard. I kept myself focused and kept grinding on. I paid for the early pace and slowed towards the end but I was able to push in the last couple of kilometers so the tank wasn't completely empty at the end. Also, the cramping I've suffered before never reared its ugly face and the calfs and achilles all held up rather well. Thought for the day: A conclusion is the place where you got tired of thinking. Yep, it's been two rest days in a row - but I have a note from my mommy excusing me from PE - so that's OK. Seriously though, I'm resting up ahead of tomorrows long run. I'm aiming for a 25 miler at a good pace. The niggles have all eased back so I'm feeling reasonably fit - I have no excuses ...... at the moment - but I'm giving it some thought. I'll be running the first 10 miles with Graham C. We're heading out from Bitton to Bath and back again on the cycle path. Then he's going to peel off as I head out on the final 15 miles over to Wick and then up towards Lansdown to pick up the Cotswold Way back into Bath before heading home on the cycle path again. Thought for the day: If practice makes perfect, and nobody's perfect, why practice? After a lack lustre day yesterday I hoped - nay, prayed - I would be up for it today. It was another session of five 1000m reps - in the wind and pouring rain - was I put off? - you bet your a#&e I was - but it didn't stop me. Sean, following recent injury, was rehabilitating with the longer stuff so joined me with the 1k's. I say joined but it was more a case of waved good bye at the start of each rep and waved the finish flag for me as I got to the line. In all honesty though I'm glad he's so much faster because he has probably the worst heel flick in the world and I was getting covered in dirty water as I followed in his wake! The session was great though, I was an average of 8s a rep quicker than last week and 5s quicker than my first week, hitting 3:28, 3:26, 3:25, 3:27 and 3:26 - and conditions were far from good . All in all it was a thoroughly bloody great session. Sean was no slouch either, knocking out 3:13's - and he was holding back to protect the injury - can't be bad. The rest of the scooby gang (Nick, Jamie, Rob and Matt) ran six 400m + 200m reps with a 60s recovery between the 4 and the 2. Not sure how it went but to my expert eye the 4's looked a little quick - but what do I know? Thought for the day: Beauty is in the eye of the beer holder. Thought for the day: Live to fight another day. Felt a bit unwell today so, after heading home from work early, I had a nap, had a puke - yes, I know, too much information but I tell like it is - and felt altogether much better. Not sure what it was but whatever it was, it wisely decided to get gone - before it really p#&$ed me off! Suffice to say I didn't train today - but hill reps tomorrow I hope. Thought for the day: A pessimist is never disappointed. This mornings run was slightly harder work than I intended. I think Rick was trying to finish me off. I was surprised to feel so good after yesterdays work out but I wasn't really ready for the run he had in store for us. We met up at the Downs and headed over to Blaise Castle on paths and side alleys I never knew existed. Somehow we managed to get all the way to Blaise and back without gracing the road for more than a few minutes. It's quite amazing how many narrow, slightly overgrown, paths there are scattered around between the houses. With the clock ticking, I felt my heart sink a little each time we took a turn that seemed to take us on a heading further away, knowing full well that we had to end up getting all the way back to the Downs - and usually these direction changes ended up taking us uphill. What was he thinking? Thought for the day: A closed mouth gathers no feet. I truly am back to normal - whatever that is in my world! I got myself out for a 23 miler in what has to be considered hot conditions. From my house down to the tow path and through to Pill, over to Portbury, then the 2 and a half mile climb up to the Clevedon road, passing through Lower Failand on the way - it's an unrelenting climb and it's nice to be back in the groove to be able to grind it out all the way to the top, then through the Ashton Plantation - with no stopping on the steep hill at the far end I hasten to add, before heading into Ashton Court for a lap of the top field and then arrival at the gym 2 hours and 45 minutes later. Which, by my reckoning is just inside 7:11 pace and totally what I was looking for. I've now set out my stall and with the five weeks of training time left it's a good base to build on. It was probably slightly foolish to run without any extra fluids but there was no sign of cramp today so the old body is adapting nicely. Of course, being the mad runner, I couldn't leave it there - and being conveniently at the gym - I put in an hour on the bike. I was a bit dehydrated come the end but nothing three pints of water couldn't fix. I was so shagged after all that, that I had to walk the four miles home because I couldn't muster anything more. But all in all it's been a great day and the achilles held up brilliantly. Thought for the day: Assassins do it from behind. The achilles feels good to go so I shall be heading out on a long run tomorrow morning. Not fully decided how long the long run should be but I'm thinking 20 miles. I'd like to get up to 7:10 mileing but I'll see how it goes. I think a steady start is the order of the day followed by a gradual pick up towards the finish. Thought for the day: A clean desk is a sign of a cluttered desk drawer. ...... as accurately determined using the Abel-Turunmore measure of achilles flexibility and strength. Also sometimes referred to as the 'it doesn't hurt as much now when I run' scale of achilles agility. The achilles was even better this morning and at the moment I'm almost to the point of not being aware of the problem at all. I certainly stressed it enough yesterday to aggravate it if it was going to be in the mood to be aggravated. I've done a little jog today without any problems what so ever but I'm going to take it easy for the rest of the day and tomorrow so that I can get in a good run on Saturday. That will be the test but I know I've turned the corner. I have to admit that even my powers of PMA were tested this week - that's positive mental attitude (in case you were wondering). I was a smidgen concerned on Monday and Tuesday. It really isn't long until Berlin and I can't afford any problems at this stage. I feared the worst but in the end it didn't kill me so I'll come through stronger. Thought for the day: Marriage is the main cause of divorce. Well what a sorry state we were all in tonight! The amazing band of cripples. Sean, away last week on a training camp, looked like he's in need of some of my vinegar and brown paper with his dodgy knee. Rob had a few problems with his little piggy going to market - or was it the one going weeeeeeee all the way home? Nick - well, Nick looked plum knackered. Jamie broke down with cramp and Rick didn't even manage to get into the session, having tight hamstrings. Of Jerry, what can I say, the old master steered his way through the debris to complete the full session in the inimitable, consistent fashion we come to expect from the maestro, 2 x 400, 3 x 300 and 4 x 200. He was the only one to complete the full session - we bow to thee o' majestic one. I ran five 1000m reps, same as last week. I needed to test my achilles in a controlled manner. It has been a worrying few days for me but I think I am beginning to see the light at the end of the tunnel. The achilles feels much better now that I've done the session. Even when walking I could feel some pain and discomfort but now I don't feel any pain at all. Miraculous cure? or just a numbing of the senses? Thought for the day: How do you set a laser printer to stun? The achilles is just about holding together - the vinegar and brown paper is doing its job! I managed a short 30 minute run around Ashton Court and made sure I put in some work on the hills to give it a test. I held the pace to easy 7 minute mileing and all in all came through relatively unscathed. I then put in an hour on the bike and by the end of all that it was aching again but within half an hour it was much better. No weights session - again - because the gym is still having some work done. I should know by tomorrow morning whether I'm going to be able to run some 1000m reps on the track in the evening. I think the chances are increasing, maybe 60% on? Thought for the day: A change is as good as a rest - what the hell is a rest? No running for me today. The hamstring is not causing too much problem but the achilles is still sore. I have my fingers and toes firmly crossed it will improve. I put in an hour on the bike and worked up a sweat - too much information, I know - but it didn't worsen my condition - my 'condition' blimey, it sounds like I'm pregnant or something - I'm not, honest! Anyhow, I'm positive I can be back tomorrow - if only for a short run. Thought for the day: One good turn - gets most of the blanket. My cunning plan was so intrinsically brilliant it could have taken the barbs off a wire fence so you could call it a washing line. Put simply, I ran for a bit .... then ran some more. That is to say, I ran a few miles before the Sunday run, met up with the posse and headed out for another few miles. A brilliant way to fit in those miles? Not quite, my left hamstring was so tight I could not really straighten my leg properly on the first run - which I had to limit to 30 minutes - so no big miles there then - and by the second run my right Achilles was playing up - the hamstring was fine though. I didn't get anywhere near as many miles clocked up as I wanted during the weekend but now the track season is complete I should be able to get in some big tempo miles during the next few weeks - provided I can keep my body held together with vinegar and brown paper that is. I'm beginning to understand how Dean Macey felt during his decathlon days - except for the athletic prowess bit, that is. Thought for the day: Make hay while the sun shines. I'm back home now after a 350 mile round trip to Sunny Mansfield in Nottinghamshire in pursuit of athletic glory in the final Midland league track meeting of the summer. So how much glory did we achieve? Well, there were some fine performances by the Wednesday night lads, most notably (and no getting a big head) Rob W with some impressive long and triple jumping - setting new PB's in both and winning the triple in the process. Nick 'Ever Reliable' Todd made it the usual 1st in the 800m in a decent time of 2:02 in windy conditions that were not conducive to fast times - that's my excuse anyway. Another of the Wednesday crew, Jamie L, ran but I'm not sure how he went, think he scored good points though. Special mention to team manager Rick, who doubled up in the 1500m and 3000m. He produced a Marvin Gaye style sprint finish in the latter to over take the chap in front - I mean Tyson Gay, no, on second thoughts, maybe we'll stick with Marvin. I had a decent enough run in the 400 hurdles. I was a little disappointed to run just outside of my PB - but I'll blame that on the windy conditions in the home straight. I fared better in the 3k Steeple Chase, managing to scrape home 5s inside my previous best. I felt a bit jaded today - not sure I'm the best after driving long distance but what the heck. I finished off the day with a decent run in the 3k flat, finishing about 7s outside my PB and claiming 2nd in the B-string but to be honest, I was just glad to finish. ...up over Dundry. Got out for a steady 11.4km up over the top, as they say in the trenches. It took me twenty minutes before the legs were flowing properly but once I got into my rhythm it was really rather nice out there. The worst part of the run came about fifteen minutes in when the unmistakable acrid aroma of cow dung came wafting across the still country air spreading its olfactory unpleasantness and suffocating the life out of everything caught in its path - OK, so it wasn't quite that bad - but taking deep breaths of that stuff was not recommended. I was happy when I got into my rhythm so I could get the hell out of there. I enjoyed it tonight. No pressure. No need to leggit. Just a nice steady run. I think it's probably done me the world of good for tomorrow. Alright, calfs then but either way they're much better today. I decided to pull a rest day as I feel a little jaded but I did at least manage to put in half an hour on the bike and half an hour on the weights. I wasn't intending to run tomorrow but I think I'll head up over Dundry in the evening for a 50 minute burst. Then it'll be the 3k Steeple Chase on Saturday which I am looking forward to - it's just that damn drive to Mansfield that mars it slightly! Thought for the day: How do you tell when you're out of invisible ink? My calfs are still tight. Too tight to try and hit some quick 200's like the lads - regarding which I have to say it was another good turn out. There were a couple of changes to the line up from last week with Harry M (who, like me, ran the Bridge Inn yesterday - now that's dedication to duty and no mistake) and Ed in for Sean and Jamie. They were knocking those 2's out at 26s for those at the front down to 32s for those on read guard duty - and no I'm not listing who did what - my lips are sealed. In my book that's not a bad bit of pace going down. Thought for the day: Every day you miss training is one day longer it takes to be good.